Spray mop system with adjustable width microfibre head. Window cleaner with microfibre head, plus rubber squeegee, hand held or on a pole. Hand brush, with cleaning comb. Floor brush with long handle. Sweeper, dustpan and mop can be designed in a new combination. 1 x Sweeper. Your best sweeper for hardwood, concrete, linoleum, marble, interior and tile. Plug and connect them to the sweeper machine. RUBBER LIP DUSTPAN: The rubber lip on the dustpan is designed to give you optimum results while brushing up, the lip sits flush to the floor so is perfect for uneven surfaces. Once your dustpan is full, you can easily tip it into a waste bin. Long Handled Dustpan and Brush 2 Piece Set. Dustpan Height: 750mm. Dustpan: 230mm x 240mm. Flat brush. the broom can be snapped into the blade handle. wide sweeping area. suspension for hanging. 1PC Wiper mop (with scraper). Suitable for a variety of places, easy to sweep away dust, and even dead corners can be cleaned. Cleaning hair is not sticky, and the scattered hair is swept in a pile easily. Dustpan and brush set from Country Club. Dustpan has a rubber lip and grooved handle grip. Brush features a comfortable soft touch, non slip rubber grip handle. Nylon bristles. Brush and pan clip together for easy storage. Good quality colour coded dustpan. Small hanging eye on the base of the dustpan for better storage. Ideal for cleaning and sweeping surfaces such as tiles and hard flooring. Gentle on surfaces so won't scratch floors etc. or flick dirt around. Kitchen Craft Living Nostalgia Traditional Dustpan & Brush Floor Sweeping Set. Dustpan has a soft flexible lip that seals to surfaces so dirt is not swept under the dustpan. Brush bristles have just the right amount of flex without flick ensuring dirt ends up in the dustpan and not spread around the floor or worktop. This set comprises of a heavy duty plastic dustpan and soft natural hand brush. The dustpan has a deep collection area and is ideal for outdoor use. The soft natural hand brush is ideal for decking and patio area's and can be used in wet and dry condition. Good quality colour coded dustpan. Small hanging eye on the base of the dustpan for better storage. Gentle on surfaces so won't scratch floors etc. or flick dirt around. White handle with colour coded bristles. Broom & Dustpan set. Long Handled Dustpan and Brush. They prevent the need for bending down to sweep. Clearance Wallpaper. Wallpaper Borders. A great aid for the elderly as well as those who have trouble bending. 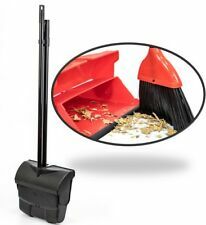 The dustpan features handy cleaning cones, which help to remove excess debris from the broom head straight into the dustpan. With a flexible rubber edge on the dustpan to help mould to uneven floor surfaces, the Clean & Close pan, along with the soft bristled broom, effectively collects dirt and dust from hard floors. Hard plastic pan with brush that slots into the pan for neat storage. 175mm wide. This broom adopt the latest advanced technique,No Electricity,No batteries. Take handle grip and slide over handle. 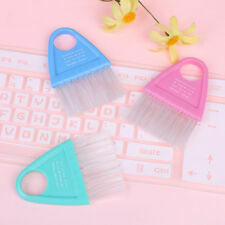 In order to facilitate the cleaning of hair, the original quick dismantling parts, without using other tools, you can remove the brush, cleaning. 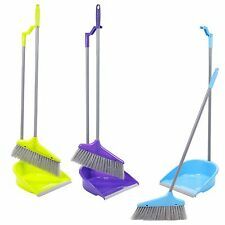 1 x Heavy Duty Lobby Dustpan & Brush Set. The long handle prevents back ache as you do not need to bend down to pick up rubbish. 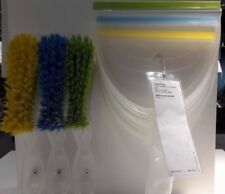 Sold as a set - include 1 x long handled stiff brush and 1 x long handled pan. Bentley Forester Garden Shovel Pan & Handbrush Set. FSC timber stiff bassine hand brush. Rubber lipped for easy collection of garden debris. IV, HS, KA27-28, KW, PA20-49, PA60-78, PH17-26, PH4-44, PH49-50, AB31-38, AB40-56, ZE. Revolutionary Simply Clean Foot Dust Pan and Telescopic Brush Brand New What makes the Simply Clean dust pan and brush set special? Who would believe there were so many improvments that could be made to this staple cleaning kit after so many years? 3 Brilliant colours mint green, raspberry red, marine blue. One will be selected at random for shipping. Metalised telescopic handle extends from 54cm to 114cm. No more back breaking bending down, adjust to suit yourself. Right angled bristles on brush head, for better sweeping performance Foot operated dust pan. No bending down, except when you come to empty it. 1PC Wiper mop (with scraper). Design Durable Vehicle Floor Cleaning Squeegee Water Mop Wiper Foam Handle. Suitable for a variety of places, easy to sweep away dust, and even dead corners can be cleaned. Dustpan Size : 19.5 x 13.2 x 2.7cm / 7.7" x 5.2" x 1.1" (L W Max.T);Hand Lever Length : Both 7.5cm / 2.95". Color : Black, Pink;Broom Size : 17.5 x 11 x 0.8cm / 6.9" x 4.3" x 0.31"(L W T). Dustpan With Front Edge Rubber Stip For Perfect Pick & No Marks On The Floor. Brush Length: 22CM. Brush Height: 86CM. Light Weight, Heavy Duty & Durable. Long handle dustpan and broom. Graphite Long Handle Dustpan Set. This Addis stylish design is made even better by the fact that the long handle reduces the amount you have to bend over, in turn reducing backache.